Moon in Leo makes people active, more optimistic, sensitive to signs of attention and compliments. They tend to embellish reality, to see everything in a rosy light, they have a strong craving for pleasure, they want to festivals and entertainment. I would like to draw attention to his person, to impress, to fall in love, flirting. Feasts in this period are obtained cheerful and ambitious. The money is spent on luxury items and all sorts of stuff. This is the best time for fun and relaxation. The cases in this period are successful, because the moon is in Leo strengthens organizational skills and thirst for action. It works well head. People readily grasp ideas and proposals to do anything or to organize. Often manifests passion, people willing to take the risk, if he felt he could win. Relationships with colleagues and superiors are good, they all want to like each other, so it is a sin not to take advantage of an opportune moment to appeal to the authorities with requests and suggestions. Bosses do not usually refuse to advice and help as individuals and in the work plan, especially if you’re with him respectful and gracious. People are impressed by the dynamism in contacts and businesses, they gratefully accept acts of kindness and generosity. Stressful aspects to the moon planets cause a desire to show itself in all its glory, which can be expressed in boastfulness and arrogance. This entails erroneous conclusions and rash actions. People become more sensitive to how others relate to them. They hurt inattention to his person, which they perceive as neglect. At the same time they themselves can also be arrogant towards others. The pursuit of pleasure, appears in this period, generates wasteful, so people are easier to part with money - for example, to buy things they really do not need hitting a flattering tips sellers or lose their gambling. 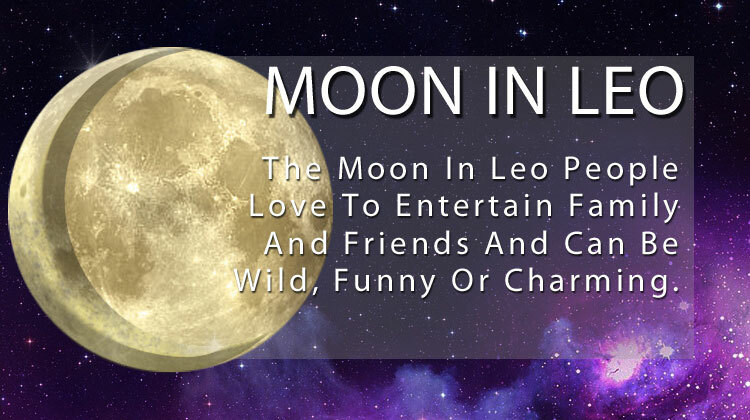 The charming, cheerful Leo Moon appears bright and cheerful. Leo - a great sign for the moon, because it adds to the warmth of its influence, persistence and idealism. Lunar Lions are very emotional, act on their heart more easily than on reason. They learn everything quickly, accurately, and literally on the fly when affected their feelings. But if the object does not cause their emotions, their interest in it quickly disappears. Sensory impressions received from the outside, Lunar Lions perceive on an emotional level. To force them to change their opinion, we must first work on their feelings. One of the most striking features of the lunar Leo - the reluctance to obey someone else’s rules. They are very intelligent and receptive to new ideas, but do not tolerate pettiness and narrow-mindedness. They like to be in the spotlight, to play a prominent role in society, especially their draw theater, music, painting and other arts. Most lunar Lions have a great sense of humor and enormous personal charm, to communicate with them - great fun. From them comes the energy of optimism, transmitting those who associate with them excitement. If nothing interesting and fun happens, lunar Lions certainly try to be the center of attention in the course of inventing something original. Sincere, sociable, communicative, they, like anyone else know how to cheer up others. Moon Lions are able to successfully manifest itself in joint projects, as They have the gift to inspire people. Faced with a problem, they immediately begin to look for a solution, rather than sit idly by, complaining of it. As natural leaders, they often feel that they have a specific mission in life. 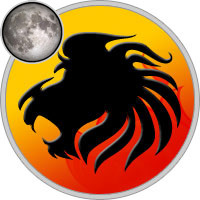 If the Moon has negative aspects to other planets, the moon Lion may become too powerful - one of those who always and everywhere just prefers to give orders and not carry them. But the enthusiasm and love for the moon Leo usually help people to forgive him for this behavior. Vanity - the main weakness of the lunar Leo, many of them become easy prey for anyone who knows how to make clever compliments. They always need an audience and in love with the attention. It should be noted that they are rarely deprived of them, for the Moon in Leo provides his players love others. New Moon in Leo - spend this day in public, namely, go to the theater, cinema, museum, or anywhere else where more people. On this day, the best chance to have a romantic relationship. If you already have a half, then arrange a romantic evening at home. Family scandals that day bad work out, so love will only purr next to each other. Waxing Gibbous in Leo - On this day, unable to hold a party, soiree, which are improving the old contacts and making new friendly relations. Full Moon in Leo - if you have long been boiling in my soul, that to this day, you always find some appreciative listener, or rather you do find it. Talk about your problems with your family, relatives, friends or just acquaintances. You will be removed from the outpouring of pent-load and return you to the good mood. Waning Gibbous in Leo - any activity will lead to success, be resolute on this day easier even some shy people. Your gifts will be remembered recipients and come to their liking. Moon in Leo helps to prove their potential and creativity, freedom to acquire personal power "to" gain fame, love, warmth, acceptance by society. The time is favorable for jewelry stores, theaters and palaces. Aries - under the Leo Moon go on a romantic date, flirt, make new acquaintances. Take time for creativity and communication with children. Taurus - under the Leo Moon take care of your family, talk to parents, get your home beautification. Gemini - under the Leo Moon communicate, conduct business negotiations, to prove yourselve, express thoughts and be sure to take a stroll. Cancer - under the Leo Moon solve financial matters, shop, give gifts. Leo - under the Leo Moon take care of your appearance and beauty guidance. Virgo - under the Leo Moon get enough rest, allow yourself to relax. Libra - under the Leo Moon communicate with friends, make plans for future. Scorpio - under the Leo Moon be assertive in careers and achieve you goals. Sagittarius - under the Leo Moon expand horizons, visit the temple or go on a journey. Capricorn - under the Leo Moon requires compliance with the law, to deal with child support, taxes, and be sure to take the time to intimate contact. Aquarius - under the Leo Moon develop personal and business relationships, as well as any communication with the outside world. Pisces - under the Leo Moon take care of your health, pay more attention to work and daily duties. The momentum of the Moon in Leo makes "sing" the entire circulatory system. Now it is much more active than the other days. In the days of Leo sometimes more back pain and heart a little "going crazy." Moon in Leo increases the sensitivity of the heart. Who has heart problems should avoid tiring journey and all that overstrains heart and circulatory system. It is advisable to refrain from unnecessary worry. Do not give stress on the heart, as this can result in a heart attack or heart failure. In the days of Leo person is exposed to various sciatica. It is impossible to waste physical forces, as it would require significantly more power consumption than usual. After such a waste of energy, when the Moon enters Virgo, there may come a painful condition. Therefore, physical strength during the tenure of the Moon in Leo should be spent sparingly. You may see the nervousness and insomnia. At this time, you can treat all vascular diseases and diseases of the nervous system (convulsions, tremor). Recommended treatment shins, joint diseases of organs of vision. It is not necessary to touch the moles, warts and skin roughness on. When the moon is in Leo, ruled out surgery in the heart, the entire cardiovascular system and circulatory system, and rsber spine, diaphragm, spleen. Contraindicated for heart surgery and all the things that put a strain on the heart. However, in the days of Leo can be operated eyes and tibia and give the burden on those areas of the body. Safely held plastic surgery on his face for correcting the shape of the chin, wrinkles and eliminate fat in the neck and hips. Permitted thermal and surgical lifting, peeling, physiotherapy. Moon in Leo - a very favorable time for cutting hair. The hair becomes stronger and more luxuriant. If the day falls on a full moon Leo - shearing effect is enhanced. If the child’s first haircut to make at this time, then the baby will be in time lion’s mane. In the days of Leo manages well perming hair - they are obtained especially curly. Those who are not seeking curly mane, but prefers light hair, make a perm at the Moon in Leo is not recommended. Outside win, if we take these days mineral and radon baths, as well as steam baths and hot masks - they are very refreshing. In the days of Leo you can choose yourself cosmetics and make-up - would be the best choice. But shoes bought these days, quickly carried away and become unusable. Moon in Leo - a barren time, any manipulation reduce productivity of plants, including weeds. Therefore, "to touch anything that should not bring the harvest and do not touch what is his bringing a must. You can loosen, work the land, to spray from pests, plant that grows rapidly and quickly consumed, collect what should long be stored, not water, no dirt, no weeding (weeds climb again very quickly). Leo lunar days - the time to boast harvest. Handle with garden tools carefuly - risk of injury.